In the 1970s, scientists happened upon a curious phenomenon about sound waves in the ocean and swim bladders in fish: Bony fish have gas-filled sacs inside their abdomens called swim bladders, which help them maintain buoyancy in water. When low-frequency sound waves (the kind used by the Navy to track submarines, or by industry to search for oil and gas beneath the seafloor) come in contact with swim bladders, they resonate much like a tuning fork and return a strong echo. For decades, Tim Stanton, a scientist at Woods Hole Oceanographic Institution (WHOI), made a mental note of this phenomenon, thinking about how it could best be exploited someday to help detect fish. That is something the Navy (to use sonar more effectively) and the National Marine Fisheries Service (to assess fish stocks) are both keenly interested in. For the latter, low-frequency sonar systems were too large and expensive for practical use. Stanton kept the idea in the back of his mind during the 1980s, when he was a scientist at the University of Wisconsin, Madison, where Dezhang Chu, now Stanton’s colleague in the WHOI Department of Applied Ocean Physics and Engineering, was a graduate student, along with Mike Jech, now a scientist at the Northeast Fisheries Science Center in Woods Hole, Mass. 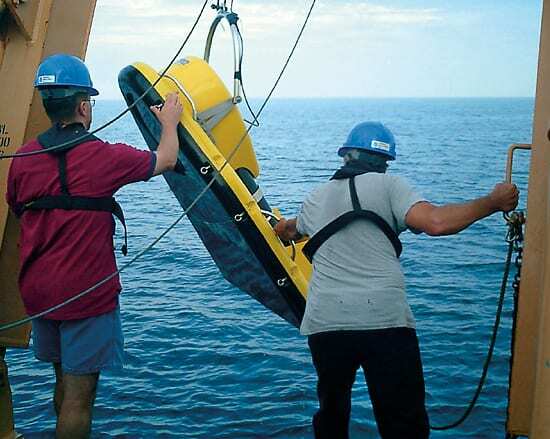 Stanton watched the development of smaller, cheaper commercial low-frequency sonar systems made to survey the seafloor, both for marine geology research and for the oil and gas industry to site offshore rigs and pipelines. 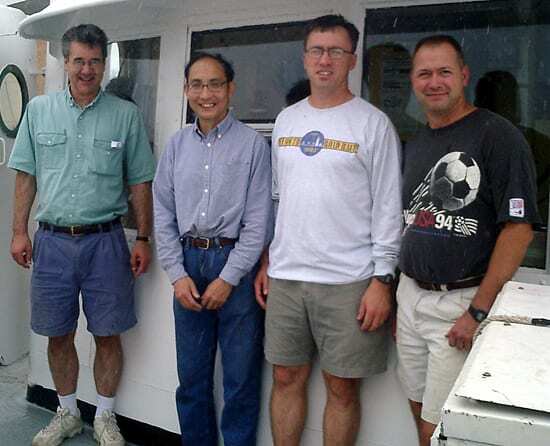 By the end of the 1990s, Stanton, Chu, and Jech thought the time was ripe to adapt the technology to count fish. Funded by the Office of Naval Research, Stanton bought a low-frequency sonar system—a bright yellow, snazzy-finned device that looks like a cross between a 1950s Cadillac and something out of Star Wars. But he didn’t get it because of its looks. 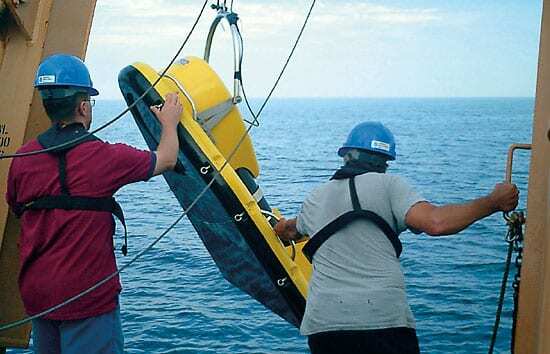 Towed on a line by boat, the sonar transmits a nearly continuous broad range of low-frequency sound waves, from 1 to about 100 kilohertz (kHz). In contrast, conventional “fish finders” transmit and detect sound at only a single high frequency—120 kHz, for example. The strength of the echoes from objects in the ocean strongly depends on sound frequency transmitted. 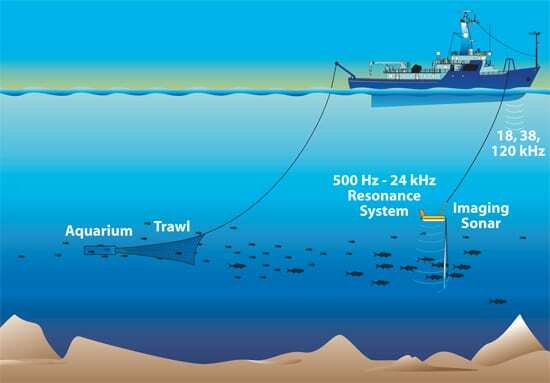 Low frequencies provide essential information, because those are the ones that detect gas pockets in the seafloor and in the fish bladders. Transmitting a broad range of low frequencies is also critical, Jech said. Just as light spans a spectrum of wavelengths representing colors, sound waves can be transmitted over a wide range of frequencies; the greater the range of frequencies you transmit, the greater the variety and detail of sound signals—and potential information—you get back. The low-frequency sonar had never before been used to look for fish. Enlisting the expertise of WHOI Research Specialist Jim Irish, Stanton and Chu field-tested it to see what signals it could collect—in tanks at the University of New Hampshire; in a Florida lake, and on two one-day cruises aboard the WHOI coastal research vessel Tioga. Then in 2005, it was time to test the system on the real thing: Atlantic herring in deep water over Georges Bank off Cape Cod. They towed the sonar system near the surface and deep in the water, over and through fish schools. For comparison, they also collected sound data from a conventional, high-frequency 120 kHz, hull-mounted sonar system. Once the sound data were collected, the work truly began. Much the way astronomers analyze radio or gamma waves gathered by space probes to infer and discern what they can’t physically see in the depths of space, acousticians such as Stanton, Chu, and Jech have conducted years of laboratory experiments so that they can interpret sound signals that can illuminate the depths of the oceans. Instead of detecting blurry patches of fish, as they would with traditional sonar, the scientists used data from the new system to detect individual fish and determine that fish swimming in adjacent schools were, in fact, the same size. The team was also able to discern that herring swim bladders resonated at a specific frequency—3 kHz—giving them the ability to detect disinct species. That not only demonstrates the value of using the sonar system to detect fish via their bladders, it opens new possibilities. With funding from the National Oceanic and Atmospheric Administration, the team will now explore the ocean using this broadband sonar sysem to distinguish fish from shrimp and other zooplankton, which have their own particular acoustic “fingerprints.” They may be able to learn how to distinguish herring from cod, which may resonate at 1 kHz, or from sharks and tuna, which don’t have swim bladders, Jech said. 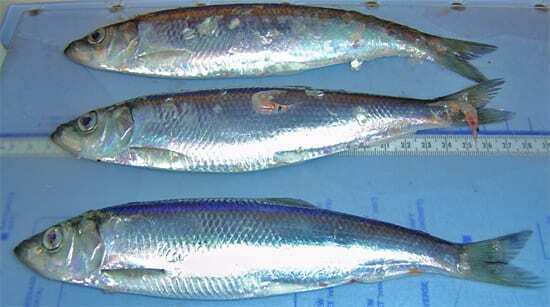 And they may even be able to decipher frequency variations that could distinguish the smaller swim bladders of juvenile herring from larger ones of adults, and thus get a handle on the demographics of fish populations.